A Royal Navy patrol ship has been sent to the English Channel to deter migrant crossings, the Ministry of Defence has confirmed. Defence Secretary Gavin Williamson said HMS Mersey would "help prevent migrants from making the dangerous journey". The UK Border Force and French authorities are already patrolling the water - now, following a Home Office request, the navy has been sent in. About 240 people have reached the UK in small boats since November. 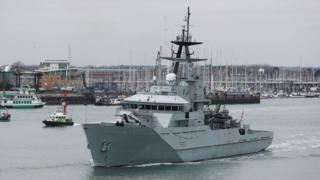 Mr Williamson said HMS Mersey had been diverted from "routine operations" to the Strait of Dover. HMS Mersey is normally used to carry out fishing patrols in UK waters and the Atlantic, ensuring boats and trawlers stick to internationally-agreed quotas. Border Force currently has two coastal patrol vessels in the Channel, as well as two cutters, HMC Vigilant and HMC Searcher, which can rescue several boatloads of people at once. The navy's involvement was requested by Home Secretary Sajid Javid, who said it would be an interim measure until two more Border Force cutters, HMC Protector and Seeker, are redeployed from the Mediterranean to UK waters. Mr Javid said: "My focus continues to be on protecting the UK border and preventing loss of life in the Channel. For these reasons, the government has decided to deploy a navy vessel, HMS Mersey, to support our existing efforts." The home secretary sparked controversy on Wednesday by questioning whether those making the risky crossing in small boats were "genuine" refugees. Mr Javid also defended his decision to escalate the UK's response, saying that the number of attempted crossings had increased rapidly since October. At least 239 people are known to have reached the UK in small boats since November, including 12 who were found off the Kent coast last week. On Tuesday, French police said they stopped 14 migrants attempting to cross the Channel from Boulogne - the latest in a growing number of people intercepted by the French authorities in the past month. The UK government has agreed a joint action plan with France, which includes the return of HMC Protector and Seeker from patrols between Europe and northern Africa.